1964 - Pablo Picasso. Exhibition Japan 1964, Nagoya City Art Museum, Japan. 1966 - 1967 - Hommage à Pablo Picasso, Grand Palais, Paris. 1967 - Stedelijk Museum Amsterdam. 1968 - Museu Picasso, Barcelona. 2008 - Forgetting Velázquez: Between 16 May and 28 September 2008, an exhibition at the Museu Picasso in Barcelona, which explains the influence of Velázquez and Picasso's work in other contemporary artists, having as central to Las Meninas.The exhibition, divided into two sections, we could see one side works of the seventeenth century Spanish painters such as Velázquez, Juan Carreño de Miranda or Juan Bautista del Mazo, and some of the Las Meninas by Picasso next to more contemporary productions, with works by artists such as Francisco Goya, Michael Craig-Martin, Josep Maria Sert, Richard Hamilton or Thomas Struth, among others. It was curated by Gertje Utley and Malén Gual. 1980 - Picasso: A Retrospective, MoMA, New York. 1981 - Picasso 1881-1973. Exposición Antológica, Museo Español de Arte Contemporáneo, Madrid. 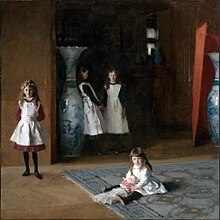 The Daughters of Edward Darley Boit by John Singer Sargent. Whistler in his studio by James Abbott McNeill Whistler. Velázquez's Las Meninas has served as inspiration not only to Picasso. The first follower of Velázquez was certainly his son-in-law Juan Bautista del Mazo, appointed court painter to Philip IV of Spain in 1661. In the portrait of the Infanta Margarita of Spain, 1666, in the backplane, one can see the placement of Charles II and the dwarf Mari Bárbola in a scene similar to Las Meninas by Velázquez. Here is a list of works by artists who also have versioned Las Meninas throughout art history. John Singer Sargent, The Daughters of Edward Darley Boit (1882), Museum of Fine Arts, Boston. Ainaud de Lasarte, Joan (1968). Las Meninas : catálogo. Barcelona: Ajuntament de Barcelona. Museu Picasso. Brown, Jonathan (1986). Velázquez. Pintor y cortesano. New Haven: Alianza Editorial. Calvo Serraller, Francisco; Giménez, Carmen (2006). Picasso, tradición y vanguardia. 38. Madrid: Museo Nacional del Prado / Museo Nacional Centro de Arte Reina Sofía. pp. 300–317, 302, 306. Cirici, Alexandre de (1986). Una lectura de Les Menines de Picasso. Barcelona: Serra d'Or nºVIII. Galassi, Susan Grace (1996). Picasso’s variations on the Masters : confrontations with the past. New York: Harry N. Abrams. p. fig. 6-4, p. 155. Gual, Malén (7 July 2009). El com i el perquè de la nova presentació de Las Meninas. Barcelona. Julián, Inmaculada (1992). "Temas y modelos en la obra de Picasso". In Universitat de Barcelona. Departament d'Art (ed.). D'Art 1992 Art, Bellessa, Coneixement. Barcelona: Publicacions Universitat de Barcelona. ISSN 0211-0768. Leiris, Michel (1959). Picasso, Les Menines 1957 (in French). París: Galerie Louise Leiris. Leymarie, Jean (1966). Hommage à Pablo Picasso : peintures. Grand Palais, París: Réunion des Musées Nationaux. Museu Picasso, catàleg de pintura i dibuix. Barcelona: Ajuntament de Barcelona. 1984. pp. 23, 696–719. Oblidant Velázquez. Las Meninas. Barcelona: Museu Picasso, Ajuntament de Barcelona. 2008. ISBN 978-84-9850-090-5. Otras Meninas. Barcelona: Siruela. 1995. ISBN 978-84-7844-221-8. Palau i Fabre, Josep (1981). El secret de Les Menines de Picasso. Barcelona: Polígrafa. p. fig. 1, p. 20. ISBN 84-343-0342-6. Penrose, Roland (1960). 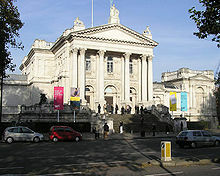 Picasso [at Tate Gallery] : the Arts Council of Great Britain 1960. Londres: Lund Humphries. p. núm. 202, p. 59, fig. 49a. Rafart i Planas, Claustre (2001). Picasso's Las Meninas. Barcelona: Meteora. ISBN 978-84-95623-15-7. Rubin, William, ed. (1980). Pablo Picasso : a retrospective. New York: Museum of Modern Art. p. 430. Sabartés, Jaume (1959). Picasso, Las Meninas y la vida. Barcelona: Editorial Gustavo Gili. p. fig. 1, p. 25. Trione, Debra J. (1994). "Las Meninas" again in 1957 : Picasso's variations on a theme [tesi doctoral], Ann Arbor. Umi Research Press. Walther, Ingo F. (1992). "Por Ejemplo: Las Meninas 1957". Pablo Picasso 1881-1973, tomo II (in Spanish). Köln: Bebedikt Yaschen. ISBN 3-8228-0672-2. Zervos, Christian (1996). Pablo Picasso : vol. 17, oeuvres de 1956 à 1957. París: Cahiers d’Art. p. núm. 351, p. 11.